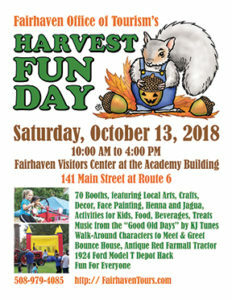 Bring the family to celebrate autumn at Fairhaven’s 6th annual Harvest Fun Day, this Saturday, 10/13/18, on the lawn of Fairhaven High School at the Visitors Center, 141 Main Street. It will be held from 10:00 a.m. to 4:00 p.m. The biggest Harvest Fun Day so far will feature a varied group of 70 booths by local organizations and businesses with arts & crafts, home décor, children’s activities, food, and sweet treats. Children’s activities include a bounce house, face painting and henna designs by Heart Body Arts, craft making, and other games and activities. New Bedford Pottery Works will have inexpensive ceramic pumpkins that children can paint. At other booths kids can decorate cookies, do nail painting and make slime! You can take a photo with a princess, the pirate Abby Black, and meet Buttons the Bear from Carousel Family Fun Center. And children can take a seat in an old-time McCormick Farmall tractor for a photo opportu­nity, courtesy of Ronald Hammond, or climb into Matt McGraw’s 1924 Ford Model T Depot Hack. For a couple of hours from late morning into early afternoon a stilt-walking scarecrow will be on hand. There will be a short dance performance by Supreme Perfection Dance Studio. All through the day, classic hits from “the Good Old Days” will be played by Ken Souza, KJ Tunes. Items for sale include, arts and crafts, home décor made from recycled and upcycled items, homemade soaps, body scrubs, photographs, jewelry, note cards, many unique hand sewn items from dolls to hats and bags, pet treats and accessories, crochet and knit items, wooden toys, pottery, candles and candle stands, hand painted mugs and plates, hand woven items, block prints, fine yarn, fresh farm produce, honey and bee-related products, fresh eggs, and much more. In front of the high school, the FHS Honor Society will hold a car wash. When hunger sets in, food choices include caçoila sandwiches and hotdogs from the North Fairhaven Improvement Association booth, as well as chowder and kale soup from the Fairhaven Rotary Club. Emma Jean’s will be selling apple cider donuts, fruit pies, whoopie pies, and other treats. The Lions Club is offering apple crisp and hot cider. Silly Bean Coffee Company will offer cold brew coffee, nitro coffee and flavored iced coffee. Homemade cookies of all kinds will be available from Crazy for Cookies. There will also be fudge from Dorothy Cox’s, Del’s Frozen Lemonade, baked goods from the VFW Auxiliary, bottled water and soda. Harvest Fun Day is organized and sponsored by the Fairhaven Office of Tourism. Admission is free and there’s parking in the Fairhaven High School lots. 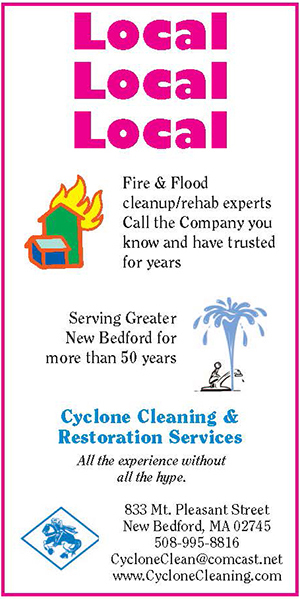 Call 508-979-4085 for info or email FairhavenTours@fairhaven-ma.gov. 17. Widemarsh Farm, fresh produce, herbs, etc. 19. One Pine Day, hand lettered rustic décor, authentic railroad spike coat racks, etc. 57. K-Pad Woodwork hand turned and carved pens, lamps, candle holders, etc.